The Ray Charles Performing Arts Center is further evidence of Morehouse College's commitment to enhancing the study of the arts in its world-class liberal arts education. 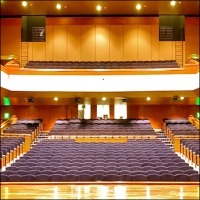 Designed to serve the academic mission of the Department of Music, as well as meet the performance space requirements of the College campus, the Center is home to the Morehouse College Glee Club, Morehouse Jazz Band, Morehouse College Jazz Ensemble and "House of Funk" Marching Band. The Center's architectural features capture the beauty of the traditional red brick bar accents and columns on the main campus, while adding the more modern, artistic elements of light colored stone accents, glass walls and cathedral ceilings.